As a well regarded Florentine artist, Sarto’s work contributed greatly to the naturalistic reformation of the Renaissance seen in later Mannerist painters. It is often said of his career that he was less ambitious, and therefore overshadowed by his contemporaries such as Raphael, Leonardo da Vinci and Michelangelo. His early work is marked by an individual style of non-idealistic and informal depictions of subjects, which use a sophisticated and emotional effect in tone and ambience. Sarto trained as a goldsmith and woodcarver, among painting apprenticeships with Piero di Cosimo (1462 – 1522) and Raffaellino del Garbo (1466 – 1524). After a brief partnership with another Florentine painter, Franciabigio (1482 – 1525), completing the Baptism of Christ fresco for the Compagnia dello Scalzo, his individual style emerged. In another collaboration with Franciabigio and also Andrea Feltrini, Sarto did Frescos for the Santissima Annunziata di Firenze in Florence. The work was regarded dearly by the Church’s patrons, The Brotherhood of the Servites Order; they called Sarto, Andrea senza errori, or Andrea the perfect. He completed a number of frescos for the church from 1509 - 1514 including three of The Life of Filippo Benizzi, a Servite saint, also The Voyage of the Magi (Or Procession of the Magi), a piece of the Annunciation, the Marriage of Saint Catherine and also the Birth of the Virgin. These works helped position Sarto as a leading Florentine painter, where his workshop was in highest regard during 1513 – 1514. Sarto worked primarily in Florence, creating what is perhaps his masterpiece in 1517; an altarpiece for the Convent of San Francesco dei Macci, Madonna of the Harpies. The piece is now in the Uffizi Gallery among another of Sarto’s pieces, Fathers disputing on the doctrine of the Trinity, also dated 1517. He had a brief two year stint at the court of Francois the First, King of France. He was easily lured back to Florence by attractive commissions from the Medici Family, and even built a home for himself in Florence with funds given to him by Francois. The King’s gift to Sarto was in trust that he would return to France, which he never did, nor did he repay the King. His work in Florence thereafter is a noted influence on the Tuscan artists’ naturalistic style of the Counter-Reformation. In 1524 Michelangelo had brought a young Giorgio Vasari (1511 – 1574) to Sarto’s studio. Here Vasari was influenced by a prominent group of artists including Sarto and his students Rosso Fiorentino or Il Rosso (1494 – 1540) and Jacopo Pontormo (1494 – 1557). It was Vasari who wrote that Sarto lacked a creative drive, seeing that he did not enjoy the success that his contemporaries did. 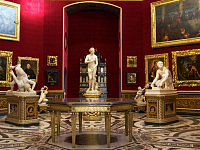 His later works included a number of pieces in the Scalzo cloisters some which hang in the Louvre now, and a Last Supper piece, which was his last highly notable work before death. 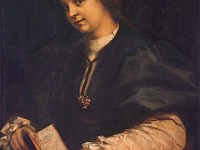 Sarto also painted self portraits and portraits of his wife, among other persons, which are still in Florence’s galleries as well as in the National Gallery of London.